Content is king...or is it? Has it abdicated the throne? There's no shortage of companies reporting a reduction in engagement and effectiveness from their content marketing efforts recently, and according to Beckon only 5% of the content gets 90% of the engagement...Surely that's pretty bad news for the other 95%! TrackMaven have reported that blog output by brands has increased by 800% over the last five years. Simply on a volume level it's harder to rank for keywords, there'll be more competitors producing similar content marketing assets for the same personas. Quantity over quality is also an issue, as reportedly during the same five year period, blog shares have decreased by 89%. Churning out run-of-the-mill content just doesn't cut it! Content marketing evolved because of a change in buyer behaviour. Our prospects didn't want to be interrupted and sold to, so we changed tact and started producing helpful content instead. 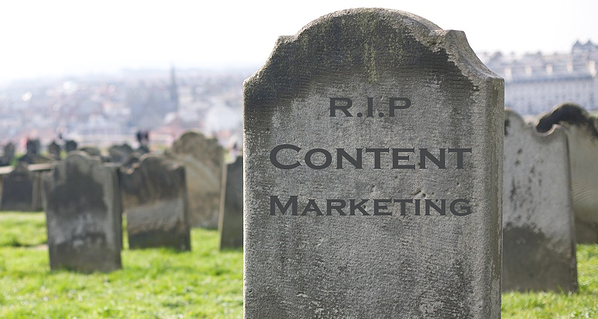 Whether it be one-too-many thinly veiled "Download our semi-relevant eBook for your chance to be sold to immediately", or a weariness to filling out data capture forms, as consumers, we're now too wise to content marketing. Even the content with the best intentions can arouse suspicion. Content marketing just isn't good at being single. A bit like Bridget Jones singing in her pyjamas, it's just a bit lost on its own. You need other tricks up your sleeve to complement your efforts. Content promotion, advertising, lead nurturing, account based marketing and events to name a few. Enough of the doom and gloom. To cut through the noise, think about where your specialisms lie, and what sets you apart from your competitors. Get laser-focused with your content and go for quality over quantity. Some segmentation options could include: Industry. geography, audience demographics or company size. Remember that your prospects will be at different stages of the buyer journey so tailor your content accordingly. Whilst an informative blog post and downloadable checklist might well be perfect for new prospects, they may not want to fill out a huge form in exchange for it...or be immediately sold to afterwards. Find the right balance and trust in your lead nurturing process. Content marketing isn't just about blogs. In fact, blogging might not even feature in your content strategy if your personas don't read them. Think outside the box and try creating some different assets which add more value for your persona. Just a few examples include; online tools, podcasts, animations, on-demand webinars, interactive templates and so on. So in short, content marketing hasn't bitten the dust, but we all need to be smarter about how we approach it.